Dalmatian Pitbull Mix - Is the Pitmatian the right dog for you? You are here: Home / Breeds / Dalmatian Pitbull Mix – Is the Pitmatian the right dog for you? Dalmatian Pitbull Mix – Is the Pitmatian the right dog for you? Dalmatian Pitbull mix: Are you wondering whether this energetic dog might be the furry companion you’ve always dreamed of? We’ve covered everything you need to know to make your decision! Where Does the Dalmatian Pitbull Mix Come From? A Dalmatian Pitbull mix, sometimes called a Pitmatian, is the result of cross breeding a Dalmatian with a Pitbull. As a designer breed, they don’t have too long a history, so to get an idea of where they came from let’s take a look at the parent breeds. Dalmatians were coach dogs, used to protect the horses of a horse-drawn coach. Their definitive origins remain a mystery however, as they were often associated with Romanies, also known as gypsies, who travelled from place to place. It’s thought they got their name from being associated with a region in former Yugoslavia called Dalmatia, where they have been traced back to in the 19th and early 20th centuries. Pitbulls aren’t actually a recognized breed of dog. The term Pitbull refers more to a type of dog than a breed. It’s generally accepted that all of the breeds that make up a Pitbull originated from Bulldogs. Bulldogs were originally bred for blood sports. Getting a designer dog can seem exciting, but the designer dog fad may be resulting in more unwanted dogs left in shelters, due to owners being disappointed with the result of their mix-breed experiment. Some say mixed breeds are healthier than purebred dogs because of their increased genetic variety, but the evidence is mixed. Check out the purebred vs. mutt debate here. The most famous Dalmatians have to be Pongo and Perdita (not to mention their pups!) of the classic movie 101 Dalmatians. Pitbulls also have some claims to fame. Did you know that a Pitbull, named Stubby was made a Sergeant during World War I after he caught and detained a German spy? Your cross breed dog could have any combination of his/her parents’ looks. Let’s see what’s most common for each parent breed in terms of physical characteristics. Dalmatians and Pitbulls both have short, smooth hair. Therefore, it’s highly probable that your cross breed will also have a smooth, short coat! Dalmatians are renowned for their distinctive spotted coats! Dalmatian fur is white with black or liver markings. Pitbull markings and color can vary widely from solid to patched, white, tan, brown, black, bronze, fawn or red. Pitbulls can weigh between 40-70 pounds. They are stocky and have a muscular build. Dalmatians weigh between 45-70 pounds with a muscular, yet graceful build. A mix between the two may have either parent’s qualities or a combination of both. Either way, you are likely to have a well-built, muscular dog with a potentially very interesting coat! Dalmatians are reserved and dignified dogs that can be aloof with strangers, yet loyal and loving family pets. Because of their history as coach dogs, they tend to be great watchdogs. Pitbulls have gotten a bit of a bad reputation in recent years as overly aggressive dogs. Let’s take a moment to review the data. There was a spike in reported Pitbull-associated serious attacks on humans in the 1980s, which led some countries (such as the UK and Australia) to impose strict laws on owning and breeding any dog with Pitbull ancestry. Most of the hype about Pitbull aggression is unwarranted however. The latest research suggests that Pitbulls have lower than average aggression towards both strangers and owners. They seem to tend towards above average dog-directed aggression, but this is by no means a universal trait. Each individual dog has his/her own personality, just like humans. The fact is that all dogs can be made aggressive. This can happen as a result of human training or by abuse. Pitbull attack numbers are often inflated because of the difficulty in assigning breeds. For example, one study found that out of 120 dogs, 25 were Pitbull types, as determined by DNA testing (dogs containing 12.5% or more of the breed composition for American Staffordshire terrier or Staffordshire Bull Terrier), yet shelter staff identified 62 out of the 120 dogs as Pitbulls. In the countries where Pitbull restriction or ban laws have been imposed (e.g. the Dangerous Dog Act, UK, 1991) there has been no decline in dog attacks, suggesting Pitbulls have been unfairly targeted. Nevertheless, we especially recommend training and early socialization for dogs with this breed’s heritage given their potential behavior towards other dogs. All dogs benefit from training. Early socialization is key for both parent breeds, due to their tendency towards guarding. It is therefore also necessary for any mix of the two. Dalmatians need a lot of exercise and have impressive stamina. These dogs are great to take with on your morning run! Be aware however that as puppies Dalmatians need abbreviated bouts of exercise, as too much in one session can be strenuous on their young joints. It’s best to leave off the hard exercise until they are two years old. Pitbulls thrive on both mental and physical challenges. They love and excel at obedience and agility training. They are a dog that will love long play sessions at the park! A quick and lonely run around your backyard is not enough for these dogs. They do best when they are a part of the family action. A mix breed will likely be full of energy based on the parents’ characteristics, and if you get a puppy be sure to engage in lots of positive puppy training, as both parent breeds are strong and assertive. Our training guides will help you and your dog understand each other and how best to navigate the world around you. Dalmatians and Pitbulls are pretty healthy dogs, meaning your Pitmatian should be too! But, Dalmatians are often prone to deafness. Dalmatians and Pitbulls both may suffer from hip dysplasia. Read on for more information about these conditions. Congenital deafness is the most common and well known health concern in Dalmatians. Puppies’ ears open at 10-12 days old and the effects of congenital deafness can be assessed before 4-5 weeks of age. Most reputable breeders will test for deafness between 2 and 4 weeks, but your vet can also perform a hearing test in the clinic. Congenital deafness has been tentatively linked to blue eye color and coat patches, but it’s difficult to draw firm conclusions as the data is varied and can sometimes be contradictory. The deafness genes appear to be recessive since they can be carried by hearing dogs who can then go on to produce deaf offspring. A dog that is deaf in one ear (unilateral deafness) can lead a fairly normal life. However, a dog that is deaf in both ears (bilateral deafness) will face significant challenges. Nevertheless, with specialized training a hearing-impaired dog can behave just as well as a hearing dog and make an excellent family companion. In fact, a recent study suggests hearing-impaired dogs are less aggressive than their normal hearing counterparts! Hip dysplasia is a common orthopedic complaint in dogs, with large dogs being more likely to be affected than small dogs. Medium sized dogs like the Pitbull or Dalmatian are less likely to suffer than say, a German Shepherd. However, there are still appreciable numbers living with this condition. Hip dysplasia is inherited and is widely accepted as a developmental disorder, that is, puppies are not born with the condition, but develop it as they mature. It results from an abnormal hip socket, which displays a grinding rather than a smooth motion in the joint. This leads to painful arthritis and can be crippling in its most severe form. It’s important to get a full background history on your new dog as well as having your vet conduct a hip evaluation to see if your dog has or is likely to develop hip dysplasia. Treatments can include surgery and/or physical therapy and supplements such as glucosamine, which can help control symptoms and prevent further degradation of the joint. Many dogs go on to live full and happy lives with well controlled hip dysplasia. Both parent breeds, and many dogs in general, may suffer from being overweight or obese. Having non-optimal weight has recently been shown to negatively impact a dog’s health related quality of life, thus it’s important to use portion control and adequate exercise to keep your pooch’s weight in the healthy range for their breed. Make sure to check in with your vet if you are worried about your dog’s weight. It also makes sense to check your dog’s ears periodically, but since Dalmatians’ ears flop down, it’s even more important to keep an eye on them and have them checked by your vet for infection, if you suspect anything abnormal. Your Dalmatian Pitbull mix will have short, smooth coat making grooming a breeze! A soft bristle brush-down once a week should keep him/her looking their best. When your bundle-of-fun pooch gets into a muddy mess, give them a bath with a special dog shampoo. Otherwise, baths only need to take place when, you know, you can smell them before they come in the room! Also make sure to trim your pooches nails regularly so they don’t become bothersome or painful while they are walking or running. Check out our article on Pitbull shedding for more information on potential hair and skin concerns. Be aware too that Dalmatians tend to shed heavily, so you may find yourself using the vacuum cleaner more than usual! If you suspect your dog is shedding too much, be sure to check in with your vet about it. Diet and/or supplements can play a role in skin and hair health and help keep the shedding at an appropriate level. Speaking of diet, your mixed breed will require balanced and healthy food from the get-go. Nutritional needs vary according to age and breed so check out our food guide for puppies here and our healthy dog food article here. Do make sure to check with your vet about breed-specific adult and senior dog needs. A Dalmatian’s average life-span is 11-13 years, whereas a Pitbull’s lifespan is 12-16 years. So, as long as your mix breed dog is healthy, you can expect him/her to live 11-16 years. Do Dalmatian Pitbull Mixes Make Good Family Dogs? Both parent breeds can be incredible family pets, so it’s likely that a mix breed would be too. Of course, individual character traits vary and it’s impossible to say whether a Dalmatian Pitbull will definitely be right for you. There aren’t any serious health concerns or conformational defects present in either parent breed that should deter you from taking one of these mixers home. We recommend you consider carefully whether your family can provide enough exercise and entertainment for this smart, high-energy dog. A Pitmatian may bore easily without proper exercise and stimulation, making them likely to develop bad habits such as chewing and digging. Always take care with any dog around young children, who may inadvertently irritate a bored doggy. If you think you’ve got what it takes, there is no reason not to adopt a Dalmatian Pitbull mix! They can make a wonderful, loving and loyal addition to your life. Rescuing a dog is a beautiful thing to do. You’ll be providing a home and love to an animal that may otherwise have neither. In many cases shelters are overflowing with dogs that need homes, which is why it makes so much more sense to get your new dog from a shelter rather than a breeder. Adopting a puppy is a huge responsibility, but one that can be immensely rewarding. When you’re ready to adopt a puppy, avoid puppy mills and pet stores that get their puppies from them (90% of pet stores get their puppies from puppy mills). Raising a puppy is challenging, but our puppy training guide will help you navigate the early stages and focus that puppy power into something that will strengthen the bond between you for years to come. Taking care of your puppy’s needs while he’s growing and changing every minute can be tough! Check out our guide to puppy development so you know you’re on track. For more breed-specific information you can also check out our page on one of the Pitbull type dogs, the Staffordshire Bull Terrier. Pitbulls have an unwarranted bad reputation for aggressive behavior and there are laws in some countries that restrict ownership of Pitbulls and Pitbull mixes. Dalmatians tend to shed a lot, which may bother some people. You may find that same trait in your mixed breed dog. Both parent breeds have the potential to be wonderful, loving companions who make great family pets! Grooming these dogs is a snap! If you’re the energetic and outdoorsy type, look no further for a great, high-energy friend to take on hikes and long walks! If you’re looking for other options for a healthy dog breed you may want to consider those listed in our guide to healthy dogs. A medium sized mixed breed dog like the Treeing Tennessee Brindle or the Swedish Lapphund could be a potential alternative to the Pitmatian. Please use the comments section below if you know of any other rescues that should be included here. Is A Dalmatian Pitbull Mix Right For Me? Owning any animal is a responsibility to be taken very seriously. 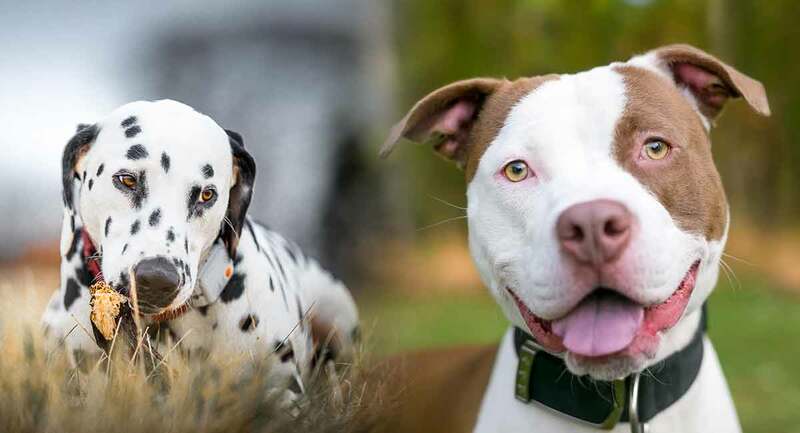 If you think a strong, loyal dog with a big heart and a lot of energy is right for you, then the Dalmatian Pitbull mix could be the perfect choice. Has this article got you convinced a Pitmatian is the dog for you? Let us know in the comments! Collier, S. 2006. Breed-specific legislation and the pit bull terrier: Are the laws justified? Journal of Veterinary Behavior. Duffy DL., Hsu, Y. and Serpell, J. A. 2008. Breed differences in canine aggression. Applied Animal Behaviour Science. Farmer-Dougan, V., Quick, A., Harper, K., Schmidt, K. and Campbell, D. 2014. Behavior of hearing or vision impaired and normal hearing and vision dogs (Canis lupis familiaris): Not the same, but not that different. Journal of Veterinary Behavior. Greibokk, T. 1994. Hereditary deafness in the Dalmation: Relationship to eye and coat color. The Journal of the American Animal Hospital Association. Nouh, S.R., Abo-Ahmad, H. M., Farghali H. A. and Saleh M. M. 2014. A Retrospective Study on Canine Hip Dysplasia in Different Breeds in Egypt. Global Veterinaria. Olson, K.R., Levy, J.K., Norby B., Crandall, M.M., Broadhurst, J.E., Jacks, S.
Barton, R.C. and Zimmerman, M.S. 2015. Inconsistent identification of pit bull-type dogs by shelter staff. The Veterinary Journal. Yama, P.S., Butowskia, C.F., Chittya, J.L., Naughtona, G., Wiseman-Orrb, M.L., Parkina, T. and Reid J. 2016. Impact of canine overweight and obesity on health-related quality of life. Preventive Veterinary Medicine.